I believe you can tell a lot about a person by the things they select and purchase to use in their daily life. A toy chest is no different. While toy chests are mostly purchased for children, I confess that I have my own toy chest and I don't let my children use it. They each have their own toy chest and they know that mom's toy chest contains mom's treasures! So what can you tell about me from my toy chest? Let me first give you a picture of what my toy chest looks like: Voila! I like pink. I grew up loving the color pink and to this day I like to add a pink flair to many things that I do. I like having a place that I can sit (or lay down) that is my personal space. Nobody gets to sit on my toy chest unless I invite them. It's my own space where I can be alone to think, read, look at pictures, etc. I am a closet diva. I don't act like a diva normally, but in my dreams I like to sometimes picture myself as a famous singer who has adoring fans and an extravagant lifestyle. In real life I'm only allowed to sing in the shower and sometimes have to cook a creative version of mac and cheese more than once a week to feed the family. But I do have my dreams! I prefer cabinets to boxes with lids. My children have toy chests with a lid on top, but I prefer having a toy chest that I can open from the front. This allows me to set my treasures inside the toy box in a way that I can organize them the way I want to. While I do have a couple of toys in my toy chest, I also use it to hold my most treasured family photos and heirloom gifts that I have received over the years, so the front opening works very nicely. Another reason that I chose this toy chest is a very sentimental one. My mother was a family counselor most of her life. She is now retired. But growing up she had a room in our home that she used with some of her clients. In the room she had a chaise lounge. 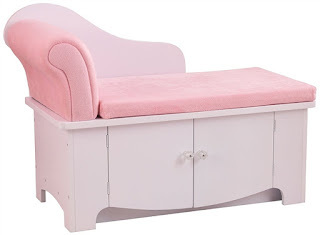 When I was having a problem at school or was worried about something or just needed to talk, my mom would invite me into that room and I would lay on the chaise lounge and we would talk. I loved the time my mom would take time just to talk to me and help me with life. This toy chest reminds me of those times with my mom. When she visits even she will sometimes comment on those times when she sees my toy chest. My toy chest represents some very fond memories! So what do you think? Do you have a toy chest that reveals things about you? If not, what kind of toy chest would you select? Today's toy chests go far beyond the simple "wooden box." I've seen toy chests for pilots, musicians, firefighters, farmers and more! In a future post I will discuss what I have in my toy chest and what that might reveal about me. I'm curious about your thoughts and any toy chest stories you may have. Paula is a child at heart! She spent several years in the telecommunications industry before deciding to become a full-time mom to her wonderful children! She believes everyone should have a toy chest that represents their dreams and contains their treasures! What's in your toy chest?